Greenify lässt Apps in eine art "Winterschlaf" verfallen (ähnlich dem deaktivieren Feature von ICS+), um so euren Akku zu schonen und die Performance zu erhöhen. Anders als ein Taskmanager, wird die App nicht "gekillt" und so in manchen fällen zum erneuten starten gezwungen, was drastische Auswirkungen auf den Akku haben kann > Gekillt>Startet Neu>Gekillt>Startet Neu usw. I'm at a point in my Android life where I can live without root access if I need to. I don't use very many root applications at all – I generally only use it for a one-touch reboot on phones without a built-in option in the power menu, and Greenify. I love Greenify. I don't use it for every app installed on my phone, but it's a fantastic tool when something just won't quit chomping down on the battery. I really miss automatic hibernation on my non-rooted handsets. Now, however, that changes. 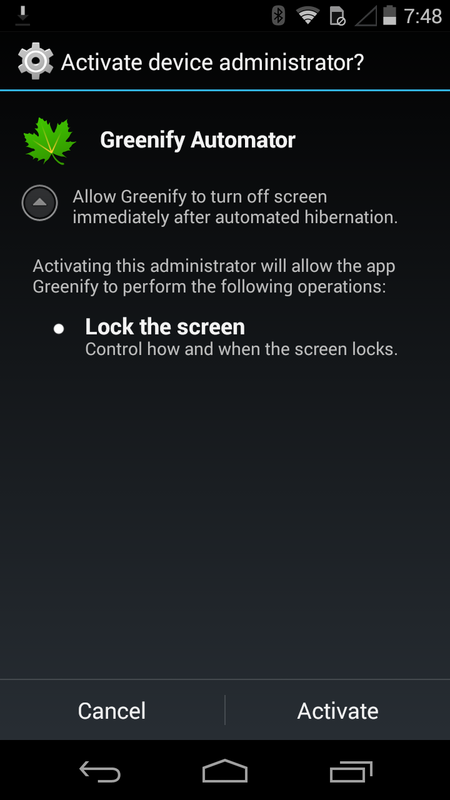 By some form of sorcery, the Greenify team has figured how to enable automatic hibernation on non-rooted phones. This drastically improves the experience compared to the old method, which basically required users to force close apps manually. Oftentimes that was more trouble that it was worth, so this new feature is definitely welcome. To get in on the action, you'll just need to enable the feature in experimental settings, and you're good to go. In case it's not working for you, there's also a "Hibernation and Lock Screen" shortcut that will kill the selected apps and turn the display off. Good stuff. Refreshed UI, a small step toward Material Design. FIX: Auto-hibernation service may not restart sometimes after working mode is switched, causing auto-hibernation OOS warning. FIX: "Hibernate" action does nothing for selected app if automation is disabled in non-root mode. 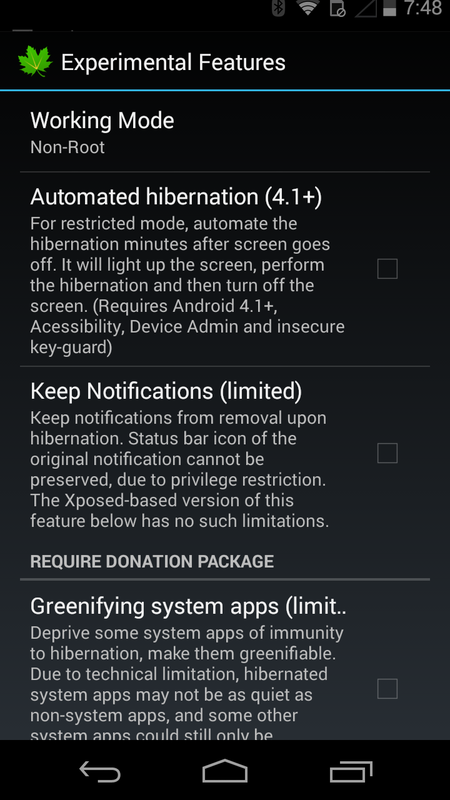 FIX: Auto-hibernation service in non-root mode may stop working but shows as normal. FIX: Manual hibernation cannot be performed if auto-hibernation failed to work. FIX: More accurate wake-up source and type. If you're a Greenify user who recently updated to Android 5.0, then you may have realized something peculiar: it was broken as crap. For me, it would constantly try to hibernate apps, but that wouldn't happen. As a result, it would try again. And again. And again. It literally drained my Nexus 5's battery twice within a four hour window. I was left with only one choice: uninstall it until an update came out. Well, that update is out. Not only does it fix the app on Lollipop, but it also brings a new interface (Material Design), improved stability, and a smaller package size...because size matter, gents. Anyway, if you can't live without Greenify, you can find it at the widget below. Greenify Dev Kommentar zum xposed Lollipop Release. That's definitely a good news. I'm currently on the vocation of Chinese Spring Festival, I'll be working on it immediately after returning. After a vast underlying rebuilding in the past months, Greenify is now running on a powerful new engine. Its potential is yet to be fully developed, but at the stage today, the benefit is already notable. The experimental feature "Wake-up Tracker and Cutoff" now works without Xposed framework (and activated always). 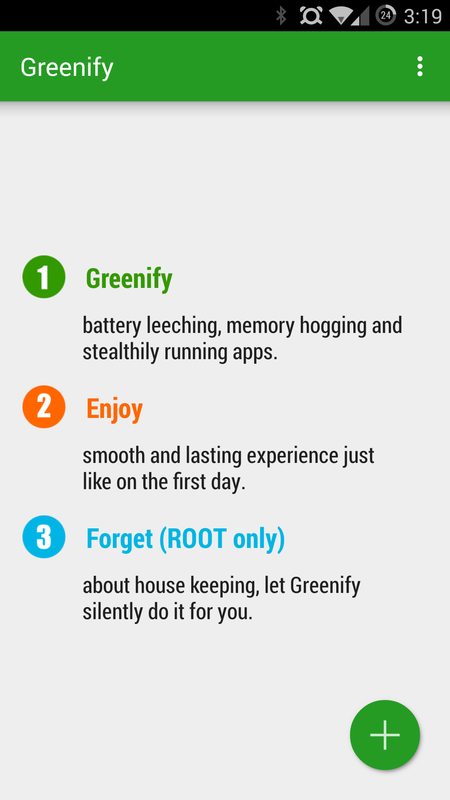 Consider its importance in Greenify, this will answer the most asked question "Why the greenified app is woken again?" for much more users. > Telephony Wake-up: Allow telephony events (such as SMS and phone call) to wake up hibernated apps. Now it's time for a gift to you supporters with donation package. Let me introduce the new experimental feature "Deep Hibernation"! 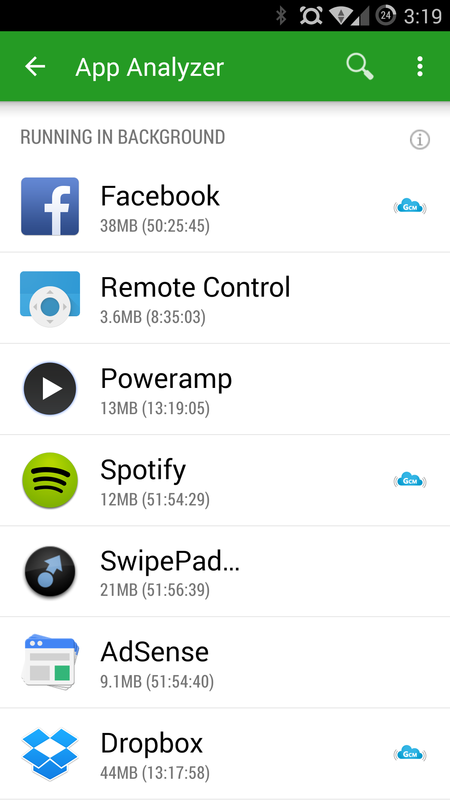 Tired of apps waking up each other just for trivial functions, but slow down the whole phone? It comes to the rescue. 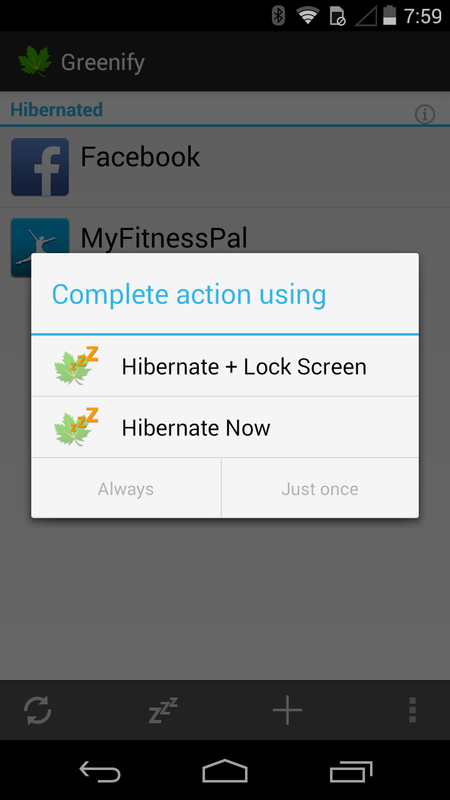 Activate this feature and enjoy a much more peaceful hibernation. Be aware, this also cut-off most bonds between apps, as if they couldn't see each other on your phone. As always, apps restore to full functionality (including its providing bonds) once awake. Even without donation package, you could still reach similar effects with the "Wake-up Cutoff" feature without Xposed for select apps (on Android 4.3+ at present, and will be broaden to older Android versions in future release). BE WARNED, THIS IS AN EARLY BETA VERSION, WHICH MAY (AND LIKELY) CONTAIN BUGS AND STABILITY ISSUES. Please help me improve it by reporting back on the community within "Beta" channel. Wirklich Legga Update! 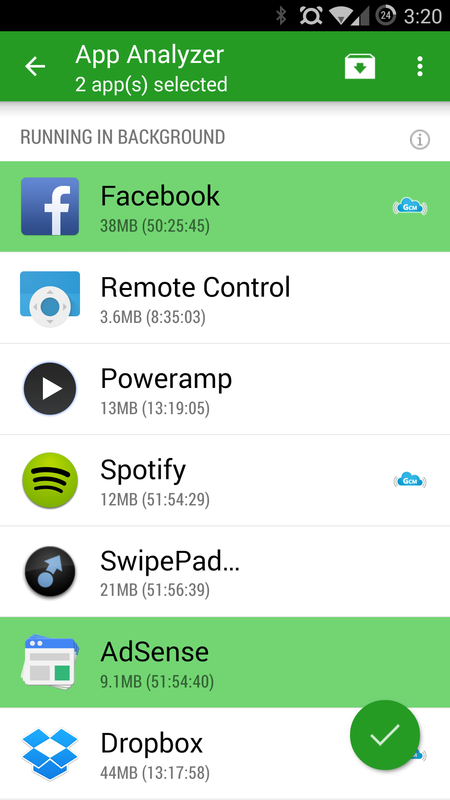 >> Greenify v2.6.1 >> "Wake-up Tracker & xposed Update"
In the recently released Greenify v2.6.1, a new engine is implemented to support the core functionality of Greenify for broader users, without Xposed and even without root. The all new "Wake-up Tracker" is the first fruit. It has many advantages compared to its predecessor. No Xposed required. Wake-up Tracker now works on all rooted devices and even partially (only "why" but no "who") on non-root devices (*1). Easier Cut-off. No more obscure technical names, no more repeated cutting, only one touch to cut all wake-up paths. Smarter Cut-off. Unlike the predecessor and all other auto-start manager tools, the all new "Cut-off" implementation only affects the outer side of the app, but not the inner side. That means, the app itself can still use all its components as if nothing is changed, despite cut-off by Greenify, so most functions inside the app are not affected at all. More efficient and steady. In the new implementation, Wake-up Tracker and Cut-off is more efficient and steady. Apps can no-longer bypass Greenify and re-attach its wake-up paths by themselves. Precise and Directional (incoming). With the power of the new engine, cut-off can be placed more precise, to cut off just one wake-up path among shared component. And for Android 5.0+, you could even place"directional cut-off", to prevent an app from waking up by your specified ones. The new chapter of Greenify is just beginning, stay tuned! Donation is always welcome to accelerate the evolution down the road. Gibt's hier intensive greenify Nutzer? Ich füge eigentlich immer die apps manuell hinzu und dann werden sie auch schlafen gelegt. Werde das aber mal beobachten,ob das in 5.1 bei mit klappt. Scheint aber zu laufen, hat bei mir gerade 2 apps schlafen gelegt,nachdem ich das Handy ne Weile aus hatte.